Winsor McCay is an american cartoonist and animator who created a series of animations in the beginning of the 21st Century. His main animations were 'Little Nemo' and 'Gertie the Dinosaur'. He was born in 1867 and spent his life drawing cartoons as well as creating literture. He carried on working untl 1927, seven years before his death. Little Nemo started as a series of comic strips which appeared in the New York Herald, beginning in 1905. These were published until 1911, where McCay created a film which included 2 minutes of animation, a very early and experimental example of the form. The story revolves around a boy called Nemo, who goes into fantasy worlds in his dreams, it is very surreal and dark. The film begins with live-action showing McCay placing a bet with his publishing friends that he can make 'Nemo' the drawing move, they give him a month to do it. He draws 4,000 frames of images and then projects them onto a screen, showing the two minute animation, featuring 'Nemo' and others characters from his comic including the 'imp'. Gertie the Dinosaur was McCay's second film which included animation, released three years after 'Little Nemo' it told a similar story to his last, with him placing a bet that he could make the dinosaur move, he was given 6 months and he produced a longer animation featuring 'Gertie' a dinosaur. McCay asks the dinosaur to do things, which it reluctantly does, all animated in frame drawings. This was a breakthrough in animation as it showed that a story which contained a characters personality and appearance in animated form, opening doors and possiblities for the future. After this animation, McCay continued to produce other versions of 'Gertie the Dinosaur', with added colouring and shading. he also moved on to more technical animation and comic-strip projects. This animation is on a more serious note, it is a 12-minute short film which explains and portrays the true story of the sinking of the American Ocean Liner, RMS Lusitania in 1918, during the First World War. One reason this was published by McCay when it was, was to create anti-german attitudes and sentiments in America, to create support for their involvement in World War One. 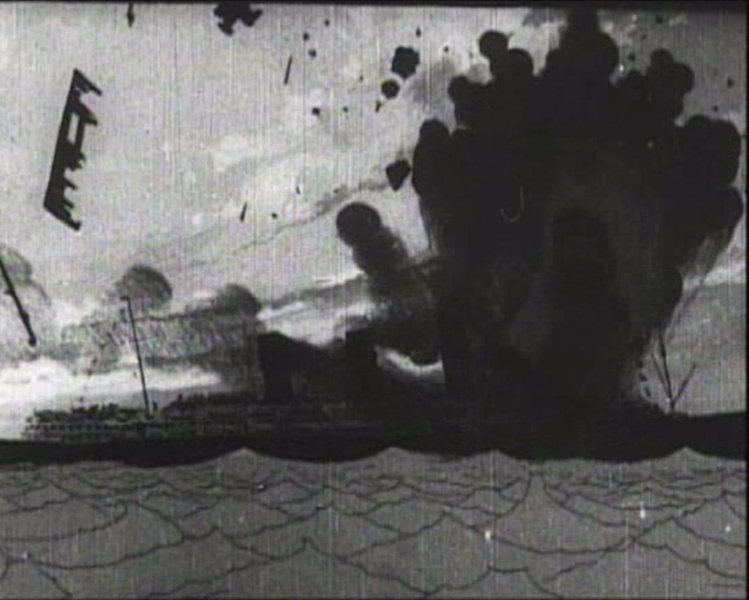 The film includes a long scene of the ship being hit by torpedos from a German U-boat submarine and the aftermath as the people are left to survive and escape. There is also a period showing the most prominent people who were killed in the disaster.